ASAP Drain Guys & Plumbing is a full-service commercial and residential plumbing company available 24 hours a day, 7 days a week. We provide the utmost quality workmanship by highly trained, uniformed plumbers who are the best in the business. 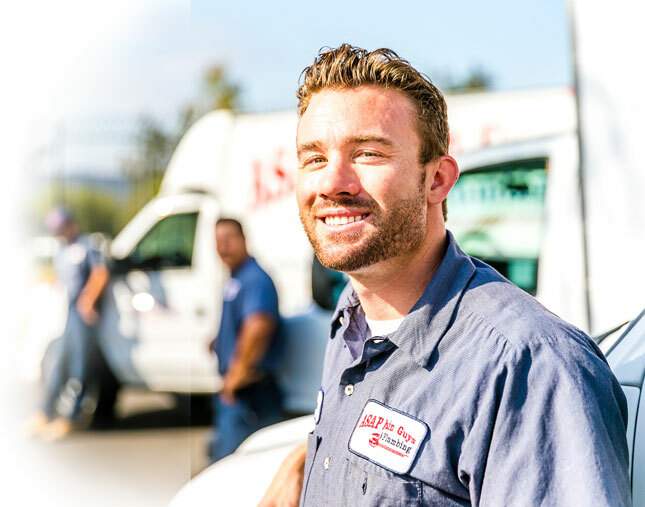 Unlike other plumbing companies, ASAP Drain Guys & Plumbing is experienced in all types of plumbing, sewer, septic and gas line work. We understand that properly functioning plumbing is vital to your home or business so we work around the clock. ASAP Drain Guys & Plumbing specializes in sewer and drain cleaning as well as all aspects of commercial, residential and industrial plumbing. ASAP Drain Guys & Plumbing is experienced in all types of plumbing, sewer, septic and gas line work. We understand that properly functioning plumbing is vital to your home or business so we work around the clock. ASAP Drain Guys & Plumbing has top of the line sewer cameras to video inspect sewer lines to see if there are any obstructions, roots or even cracks and broken portions. Cameras also help to quickly identify the problem’s location thus saving time and money. You can see your results on a private YouTube link! We install traditional and tankless water heaters and also highly recommend annual maintenance to be done to flush and drain your water heater to remove sediments that collect inside. This will make your water heater more efficient and extend the life of it. Timely, professional, friendly service. Reasonable rates with honest assessment of your plumbing needs and the experience to do the job right. Paul from ASAP was at my house quickly. I called at 6:05pm with my problem, He was there by 6:40pm. He was able to explain the problem by using a camera to scope the drain while I watched on an Ipad. He also went through the house and showed me where the lines ran through the house and how they all tied in. He is a great teacher of the plumbing system. I am very appreciative that he came promptly, was extremely nice, and was gracious enough to share his knowledge! Thank you so much ASAP-I will keep your card in a safe place for the next time I need it! Mark W.Polite, professional & good value. Some of the best customer service I've had in a while. They were flexible and had techs to my house very quickly. The techs were polite, helpful and did the job right. I definitely recommend ASAP Drain Guys. Tanner and Christian did an excellent job repairing deteriorated drains in my bathroom. They arrived on time, worked long hours, were courteous and considerate, and kept my house clean. I highly recommend them. Ramon C is great! My wife and I have used ASAP Drain Guys & Plumbing for our rental property and our personal residence. They are very professional and personal. Their prices are fair. Ramon recently came out for a noisy drain pipe when we flushed our toilet. He took the time to explain his approach to our problem and used a cost effective solution. I had other individuals say we would have to cut the drywall. As it turned out, the insulation around the vent pipe in the attic above our bathroom had fallen off causing a boombox affect to our walls. Ramon found the simple resolve without cutting any drywall saving us hundreds of dollars on unnecessary work. This company always approaches our plumbing problem as if they owned our home. Give Ramon C a call, you will always get a solution to your plumbing needs. Thank you for your great service (again)! !